A very quick entry which was picked up upon by browsing through Thomas Mogensen’s work directory in HVSC. Within the directory are a large number of tunes for a game called 24th Amaranth GP, which we assume was to be a racing game (with cars or bikes?) that never quite made it. We believe that the game was being developed back in 1991, based on the dates on Thomas’ tunes. We do not know who was to publish the game, who worked on it and exactly what happened. Thomas confirms that the tunes were just a sketch to help towards an Amiga game of the same name being developed by a Danish company. 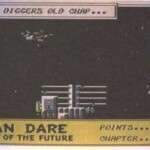 No C64 game ever existed, so its a straight case closed! Maybe the title should be 24h Amaranth GP, as in a 24 hour race? http://en.wikipedia.org/wiki/Amaranth_(disambiguation) gives no apparent motosport links in the name – I doubt there were any games in development about perennial flowers, banned food dyes or Masonic organisations? Could be! the music titles though say “th”, but we’ll find out in time i’m sure. Yeah, the name is odd – maybe they just picked it out at random when naming the game?